Ready for late spring and early summer time celebrations with those you love? 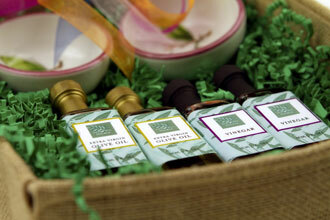 We have created specially labeled oils and vinegars and gift baskets that mothers, fathers, and grads are sure to enjoy. For Moms: Our specially labeled Mother's Day Organic EVOO, Cask 8 Balsamic, Blood Orange Infused Oil, and Chocolate Balsamic Vinegar, or one of our beautiful gift baskets. For Dads: Our specially labeled Father's Day Organic EVOO, Cask 8 Balsamic Vinegar, Rosemary Infused Olive Oil and Juniper Berry Balsamic Vinegar. For Grads: Pick one of our best selling oils and vinegars. Inert Gas: The simple way to protect extra virgin olive oil’s best qualities. Extra virgin olive oil and fine wines have some things in common: neither liquid appreciates heat, air or exposure to sunlight. While it’s relatively easy to keep olive oil in a dark glass bottle and away from stovetops and ovens that give off a lot of heat, how do you solve the problem of exposure to air that accelerates the deterioration process? Years ago, the wine industry came up with a simple hand-held vacuum product that pulls air out of partially-consumed bottles, extending the life by an extra day or two. But we now carry a smarter and very efficient solution in a consumer-sized version. It’s called Private Preserve, an aerosol can-sized application of inert gas that blankets the surface of olive oil or wine to protect it from any exposure to air. Unlike vacuum systems, it prevents any oxidation by displacing the oxygen that comes in contact with the oil. Private Preserve has been used by wine and extra virgin olive oil lovers worldwide since 1986. Each can provides up to 120 uses, so it will always be ready to gently protect your favorite extra virgin oil. Best of all, it is completely safe and will not affect the flavor of olive oil. Think of it as fresh-flavor insurance. It is a great way to protect your olive oil in your fusti or any other container and to ensure that the quality you’ve paid for stays in the bottle until it’s ready to refill.